A new ruling from the Supreme Court shows that police investigations of the Ministry of the Interior have led to a potential suspect, called “B”, who may have leaked a memo to select members of the press that proved to contain falsehoods about an asylum seeker. According to the ruling, the mobile phone use of five ministry employees and the laptop use of two of them were more thoroughly examined by police over the past months in connection with the case of Tony Omos, a Nigerian asylum seeker who was deported last December. Shortly after his story broke the previous November, a memo believed to have originated within the Ministry of the Interior was leaked to select members of the press. This memo contained allegations about Tony which later proved false or misleading. The court ruling alleges that, according to investigations, the computer and mobile phone use of B raised many suspicions. The suspect reportedly searched for the memo in question on their computer on the evening of November 19, at 18:46 and 22:20. Police found that when the computer was turned off that evening, the notice “Do you want to save changes you made to [A]”, referring to the memo, popped up on the screen. While police investigations are still ongoing, the court also ruled that mbl.is was not legally obliged to reveal who gave them the memo in question, nor to even reveal who wrote the mbl.is story as it appeared on the morning of November 20. Already the ruling is sparking discussion in parliament. 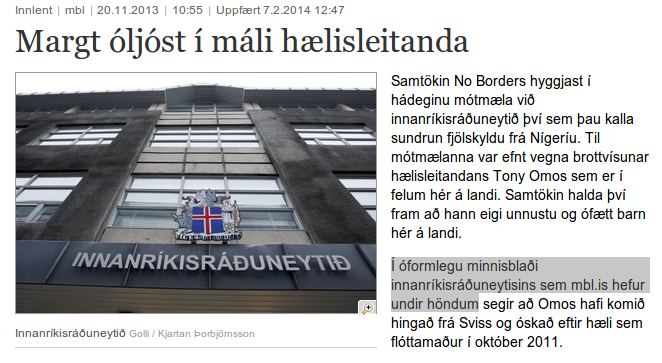 DV reports that Social Democrat MP Valgerður Bjarnadóttir told members of parliament this afternoon, “I think the minister must answer whether she can confirm that neither she, nor any of her political employees, are this B named in the Supreme Court ruling.” Hanna Birna refused to answer the question, saying that it would “not be natural” to comment on a matter under police investigation.